A Washable Nap Mat, Blanket, Pillow and Carrying Sack All-In-One.Perfect for Day Care, Nap Time, Babysitter’s and Travel. How Did SnuggleBug NapSac® Get Started? Since necessity is the mother of invention and I am a working mother of two, the idea for a nap mat, blanket, pillow and carrying sack was born out of need. One day, when my daughter, Leah, was in daycare, I observed her class at nap time and realized that the blanket I was sending to school really wasn’t enough. Leah’s face arms and legs were sticking to the school’s plastic mat. I thought maybe a pillow would help, but that wouldn’t really solve the problem of not having something clean and comfortable to lie on as well as cover her. Another problem I noticed at the day care was storage. Bed size blankets and pillows are incredibly bulky and don’t fit into little cubbies. And they can’t hang on a hook. How to store all these blankets and pillows between naps in a sanitary way is a real problem for day cares. 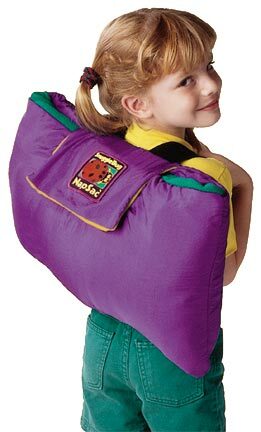 And with head lice outbreaks more and more common, I found that having an attached pillow flip into the carrying sack was an excellent solution. This entry was posted in Giveaways and tagged nap, sac, snuggle bug, win. Bookmark the permalink.